Six mothers have lost their children. Amici Dance Theatre premièred Elegy at The Lyric. 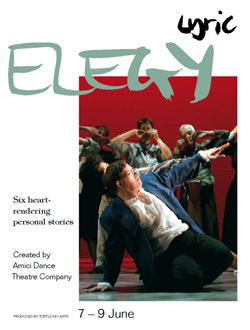 A full company production, Elegy was a thought-provoking and beautiful show which fused music, dance and text. Set in contemporary Britain Elegy told six heart-rending, personal stories of mothers who have lost their children in tragic circumstances. As tales of drug abuse, honour killing, homelessness, illegal immigration, gangland violence and prostitution emerge at the inquest into their children’s deaths, they ask, could they have been prevented? Amici enlisted the help of Director Michael Vale who has worked with the RSC and ENO, Design Consultant Julian Crouch from Improbable and award-winning playwright Julia Pascal. Costume Design by Tina Bicat, who recently received a Critics’ Circle Award for her work on Punchdrunk’s Faust. There was also a special guest appearance from “up-and-coming” aerial artists Ockham’s Razor and live traditional Japanese percussion by Nao Masuda.